Today is the first day in Advent, meaning the first of four Sundays before Christmas. In my house we start the christmas decorating on December 1st, or the 1st of Advent, which ever comes first. I might sneak in some christmas things earlier, but who is to judge me ;) On the 4 Sundays before christmas we gather with frinds and family to eat ebelskiver/æbleskiver and drink mulled wine/gløgg. This year I wanted to change it a bit with some savory ebelskiver filled with pear and blue cheese. And they are really good as a hors d’Oeuvre or snack with a glass of good red wine. Separate the egg yolks from the whites. Whisk whites with a mixer until stiff peaks form. Set aside. Mix milk with flour and baking powder till there's no lumps. Add the melted butter, egg yolks and salt. Let the batter rest for about 5 minutes. Gently fold in the egg whites, do not over mix the batter, but you don't want spots of egg whites in the batter. Heat the ebelskive pan. Fill the holes about ¾. As soon as the batter starts to bubble around the edge, turn* the ebelskiver halfway. Place a pea-sized piece of cheese and a few dices of pear + a sprinkle of chopped pecans into the batter, so it disappears. Add a little bit more batter to the ebelskiver. Turn the ebelskiver all the way, so you end up with a perfect ball. Continue cooking for a few minutes, turning the ball to keep it from burning. * I use a knitting needle to turn the ebelskiver, but you can also use a fork. 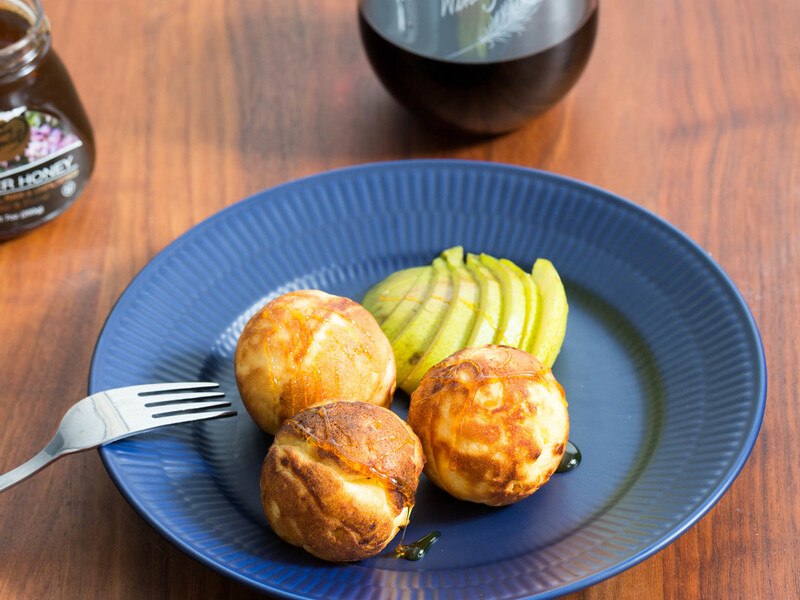 Serve the ebelskiver hot too warm with a drizzle of honey and a nice glass of wine.